This past September 11th marked my 7th year working in behavior analysis. 7 years ago I got a job as a behavior therapist, as a part-time gig. I started with just 9 hours a week, school shadowing a little guy in a Jewish Temple. Then my client list grew, and so did my passion for the job. And here I am now….certified, and in a Supervisory role overseeing teams of interventionists and dozens of clients. 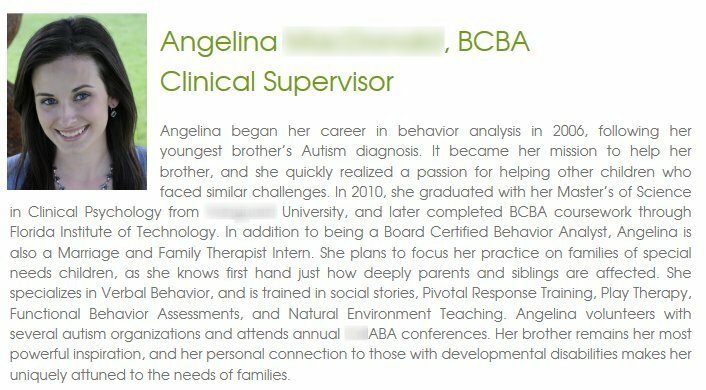 My company recently published my bio on their website, and it seems fitting to share it, as I celebrate my 7th anniversary in ABA. I didn’t set out to make this my life-long career. It started as something I could do that would help me learn more about the kind of therapy my brother was receiving. Then it blossomed into much more. It became my purpose to learn all I could in order to help my brother, and kids like him. So, here’s to another 7 years, and hoping I learn even more to help those around me.